So it might not be the most exhilarating, but it will certainly ensure your knees aren’t knocking this up coming winter. Why not tick this task off your list and breathe easy with the knowledge that your central heating system is getting the clean out it needs before the winter chill sets in. With over 14 years experience, the team at Efficiency Plumbing Services are your number one handy men. With this summers deal, you'll get a full central heating power flush service. Using only high quality Sentinel products, your plumber will conduct a flush of your system which cleans your central heating water, the pipes, pump, radiators and the boiler. This type of service helps to eliminate breakdowns and is also said to increase efficiency. Plus, the friendly team cover a range of areas including; Manchester, Liverpool, Cheshire, Warrington and surrounding areas. With all that covered, all that's left to do is sit back, relax and let your radiator do the rest! A power flush is a cleaning procedure carried out by a professional that is trained and experienced; A power flush of your central heating cleans the central heating water, the pipes, pump, radiators and the boiler. Everything that the central heating water runs through. There is only one modern procedure worth having done. This is by connecting power flush machine to the system's circulating pump or a radiator and circulating the central heating water at high flow rates for hours and replacing dirty water with clean water. Using a combination of chemicals and magnets to aid in the cleaning, once clean you add a chemical called an “inhibitor” that stays in the system and prevents the re-forming of sludge. The more sludge gets removed the move of an improvement in efficiency you will have. Clean systems break down less as no sludge means no blockages and less wear & tear on the parts that make up the system. Boilers, pumps, radiator valves and radiators last much longer if your system is clean and have the correct levels of inhibitor. Low levels of inhibitor in the system cause the radiators to rust and eventually start leaking. Causing flood damage and a repair bill. You will save money from not having breakdowns and the increase in efficiency. 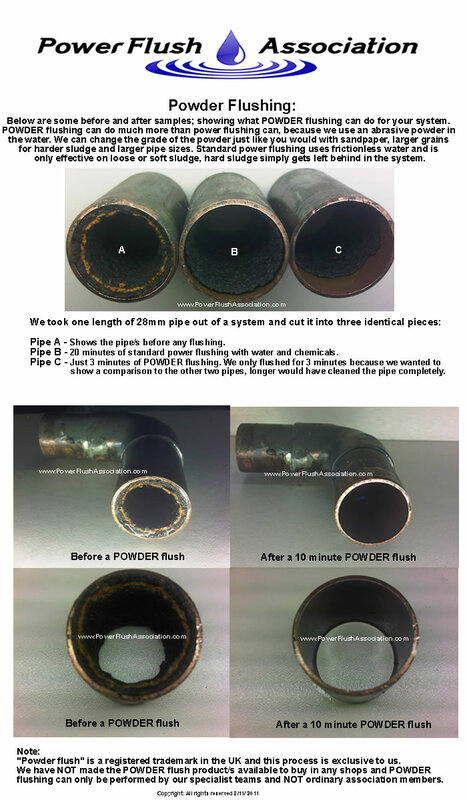 What is the standard power flushing procedure? - Sludge remover (a chemical) gets used to loosen up sludge. - Each radiator gets flushed in turn with the other radiators turned off. - Frequent flow reversals during flushing. - Magnetic filter gets used with the power flush machine to remove sludge faster and more effectively. - Boiler, radiators and all pipe work gets flushed until water runs clear. - Inhibitor (a chemical) gets added to system to prevent sludge in future. - System gets re-balanced radiator by radiator. Power Flushing prices start from £400.00 for 8 radiators. Extra cost for more radiators depending on the size of property and how many radiators there are.